Take the bottle gourd / lauki and peel it and grate it fine.Squeeze out the excess water and put the lauki in to a mixing bowl . Add the chilli powder, salt, Ajwain, besan and hing, mix well . Make small lemon-sized balls with this mixture and make a small dent with yor thumb in the center to place a kishmish close it up and make the ball smooth. 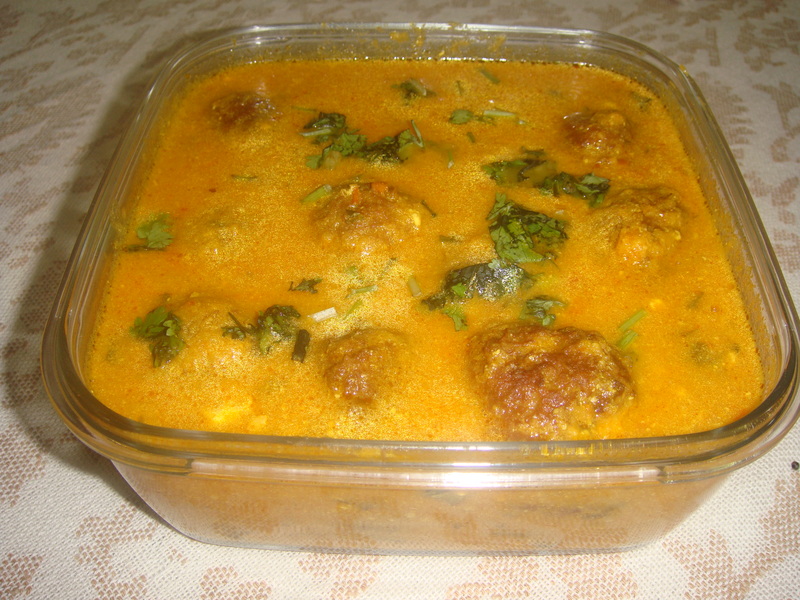 Heat the oil in a frying pan.On medium hot flame, fry the koftas until golden brown all over. keep turning to cook evenly. Heat oil in a pan add add the chopped onions.When onions turn translucent and starts to turn light golden brown , add the turmeric powder, coriander, chilli powder and salt. Fry for two three minutes,until the masala is well cooked and fragrant and is blended well with the onions . Add the tomatoes and about 1/2 cup of water.Bring to boil and simmer until the tomatoes are soft (about ten minutes). Cool the mixture to room temperature. Puree this mixture in a blender and return to the pan. Bring to boil, and add the cashew powder and whisked yogurt . Mix well, adjust salt if required. Remove from fire. Over cooking at this stage, after adding the yogurt is not recommended.Over cooking will spoil the texture of the gravy. Add gently the koftas into the gravy and let it sit for half an hour or so before serving. Serve hot garnished with coriander leaves with all Indian breads.